This is a guest post by Ana Johnson, a Registered Dietitian and certified diabetes educator. She received her masters degree in Clinical Nutrition from Central Michigan University. According to the World Health Organization, obesity rates world-wide doubled between 1980 and 2008. It is estimated that over 300 million people worldwide are obese. Obesity is a public health concern due to the increased risk for diabetes, heart disease, cancer and other health conditions. Scientists believe that the increased consumption of sweet beverages, such as soda, has played a significant role in the growing waistlines of the population. These beverages have a high sugar and calorie content, but do not provide any satiety or “feeling of fullness”. Therefore it is easy to consume a large amount of calories from these liquids without ever feeling full or satisfied, and most people will still eat a complete meal in addition to the beverage. Consuming a 12 ounce sweetened drink on a daily basis can translate to a 15 pound weight gain in one year. There are a myriad of fad diets out there that base their recommendations on eliminating certain food groups or only eating a few foods. It is easy to forget that the main formula for weight loss is very simple. To lose weight, eat fewer calories than you burn or burn more calories than you eat. A calorie is defined as the amount of energy used to raise the temperature of water by 1 degree Celsius. Our bodies are energy burning machines. It takes energy to think, breathe, talk, or walk. Since we rely so much on energy to function, our bodies are very efficient at storing extra calories (or energy) as fat for times when food is not available, an adaptation that helped us survive in the past. In our modern times, when food is overly plentiful for many people, we are more concerned with losing weight or maintaining our weight and less concerned with storing excess calories. In order to lose one pound, the body needs to be in a 3,500 caloric deficit, which will force it to access the “stored” energy or fat. In order to gain one pound, you would need to consume an excess of 3,500 calories. Spread out over a week, this means that to lose one pound per week, you would need to consume 500 fewer calories per day. For example, a person who weighs about 180 pounds needs about 2000 calories per day to maintain their weight at an average activity level. If that person was to consume 1500 calories per day instead, they would lose a pound per week. Or if that person did about an hour of moderate intensity exercise and burned 500 calories, they would also lose a pound per week. On the other hand, if they ate 2500 calories, instead of 2000 per day, they would gain a pound. Sweetened beverages have been consistently linked to weight gain in multiple research studies. The consumption of added sugar in food rose by 74 additional calories per day from 1962-2000, according to a 2003 study published in “Obesity Research”. Sugar from sweetened beverages accounts for 47% of all the total added sweeteners consumed. An average 12-ounce sweetened beverage, such as soda, contains about 150 calories and 40-50 grams of sugar, mostly from high fructose corn syrup. Most people who consume caloric beverages do not adjust their intake to account for the calories in these beverages, which leads to weight gain. Add in just one 12 ounce soda, juice, or other sweetened beverage every day for 365 days, and you will consume 54,750 extra calories in a year or the equivalent of 15 pounds. In 2006, the American Journal of Clinical Nutrition published a review of all the research conducted regarding the relationship between weight gain and sweetened beverages. Almost all of the studies reviewed showed a connection between soda consumption and weight gain or obesity. A study called Growing Up Today (GUT), reviewed data from over 10,000 children and teens and found that those who were overweight consumed up to 8% more calories from sweetened beverages than those of a normal weight. In a study of adults, those who drank more than one soda per week were about a half pound heavier than those who didn’t. And that is just for one additional soda per week! In a study following adult women long-term, those who increased their soda consumption by one per week during a 4 year period, gained an average of 9.2 pounds. Scientists believe that the reason soda leads to weight gain is because liquid calories do not increase satiety, or the feeling of fullness, therefore people do not compensate for the calories by eating less overall. A study from the International Journal of Obesity, published in 2000, showed that when subjects were given the same amount of calories in either jelly beans (solid sugar) or soda (liquid sugar), those who had the jelly beans compensated for the calories consumed by eating less at other times. Whereas those who had the soda, did not compensate for the calories consumed and ate the same amount, leading to weight gain. Part of the reason why soda and other sweetened beverages lead to weight gain is because many are sweetened with high fructose corn syrup (HFCS). It has been shown that HFCS increases fat gain in rats. HFCS may also cause insulin resistance, a condition where the body’s cells stop responding to the action of insulin. Insulin tells cells when there is food or sugar available after a meal. If the cells stop responding to insulin, the sugar from food remains in the blood, leading to chronically elevated blood sugar known as type 2 diabetes. Weight gain is not the only problem with consuming sweetened beverages, it has also been shown that these drinks can increase the risk for developing diabetes. The Nurse’s Health Study, a long-term study which followed over 90,000 nurses over a 10 year period, found that those who consumed one or more sodas or fruit drinks per day were significantly more likely to develop diabetes. The reason may be due to the the quick absorption of sugar from soda which in turn leads to a flood of sugar into the blood stream. The body is not able to cope with so much sugar at once and some of it may remain in the blood stream, causing elevated blood sugars. A high consumption of sugar may also result in higher levels of inflammation, a precursor to diabetes. Inflammation is the body’s natural immune reaction which helps heal injuries It is the reason why a cut becomes red and swollen when it is healing. Scientists have found that excessive consumption of sugar, as well as obesity, are triggers for systemic, or all over, inflammation in the body. Inflammation is seen as a potential trigger for insulin resistance, and therefore type 2 diabetes. Further research is needed to fully understand the mechanism for how exactly this happens. 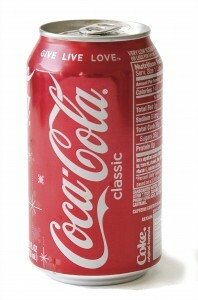 Most people probably know that regular soda is not a health beverage. Fruit juice on the other hand is often seen as a healthy beverage since it is made from fruit. What many people don’t realize is that fruit juice can be higher in calories and sugar than soda. A 1997 study in “Pediatrics” found that children who consumed greater than 12 oz per day of juice were 32% more likely to be obese or overweight. Some fruit juices may also contain high fructose corn syrup as an added sweetener, leading it to be just as unhealthy as any other beverage sweetened with HFCS. If the idea is to drink fruit juice for the vitamins and health benefits, then you are far better off eating the whole fruit rather than the fruit juice. The whole fruit contains all the vitamins of the fruit as well as the fiber. In the juice form, most if not all of the vitamins and fiber have been removed. It may be tempting to consume diet drinks which do not contain calories or sugar. Unfortunately, these beverages can still be harmful to your health. There have been several long-term studies that have shown connections between increased diet soda consumption and an increase in metabolic syndrome. Metabolic syndrome is a group of symptoms such as high blood pressure, insulin resistance, obesity, and high cholesterol which increases one’s risk for heart disease and diabetes. The MESA study published in 2009, evaluated the connection between diabetes, body weight, and diet soda consumption in over 6800 people of various ethnicities. Of the 14% of participants who consumed greater than one serving of diet soda daily, the risk of metabolic syndrome was 36% greater than those who did not consume diet soda, regardless of calorie intake or other factors. Diet soda drinkers had a 67% increase in risk for type 2 diabetes. Beverages are meant to quench our thirst and fulfill our hydration needs. The most efficient way to do this without gaining weight or increasing your risk for diabetes, is to drink plenty of plain water.